LingvoSoft Suite English <-> Vietnamese for Windows Mobile is a universal language management and translation solution for devices running Windows Mobile. This fully integrated collection of the most popular and efficient LingvoSoft titles answers the needs of anyone who uses foreign languages for business, travel or study. 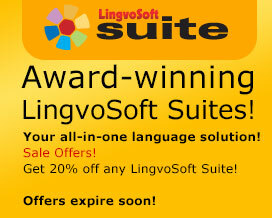 The LingvoSoft Suite English <-> Vietnamese for Windows is a dynamic language learning and translation solution for your desktop or laptop PC. This remarkable utility answers all the needs of almost any user of foreign languages. Businesspeople, travelers, students, and professional translators will all benefit from its wide range of unique features. Fully-integrated and compatible with the most popular MS Office applications (Word, Internet Explorer and Excel), it extends the functionality of your existing word processing and internet tools with the added benefit of instant translation. LingvoSoft Dictionary English <-> Vietnamese for Windows is part of a complete language learning and management solution for your PC. Providing instant bi-directional translation of all the words and phrases in its massive database, it is one of the most complete language resources ever designed.